Sorry I have not been in touch much. I haven't been following many blogs - including my own. And, my Blogger site's been buggy lately, taking up to half a minute to post a comment. Talking of buggy, the bug I've had makes its victims feel tired for weeks after the symptoms have disappeared, or so the doctor says. Am I sitting around because of that, I wonder, or because inactivity has fed on itself and turned me lazy? 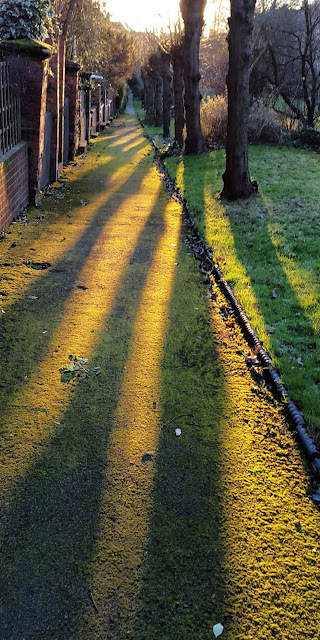 T.'s been more energetic than me, so that's encouraged me to go out, visit a few people, and take a few photos, including these art deco style tree-trunk shadows. Sending so much time indoors means I've been too much on Twitter, and I hate it because everyone's become so political - including me. Every day some new mad and disturbing thing seems to happen and I can't help wondering where it will all end. I'm glad to say, though that we've begun doing a little Tai Chi. One of our daughters is an expert and just made us a little video of 8 minutes-worth to practice each day. It doesn't sound much but feels surprisingly good, with the graceful, purposeful movements helping one's focus on the here and now. 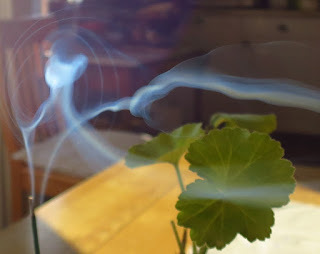 Burning incense has been a pleasant discovery, too - the smoke makes endlessly fascinating shapes. Oh, and I've finished Helen Dunmore's "Birdcage Walk" which I mentioned last post. Great characters, story and plot - but what I liked best of all was the vivid picture it gave of 18th century life in Bristol. I've been trying to write some historical fiction myself so I know how hard it can be to include period detail without seeming to give a history lesson. Life over 100 years ago was so comprehensively different from now that unless you explain the background, you risk giving quite the wrong impression. For instance, lets say your plot needs your 3 year old son to drink a large glass of beer. In a modern novel, this might seem like a problem for your little lad, and probably a problem for you, too. But in the late 18th century, right into the 19th, it was common for children to drink alcoholic drinks. 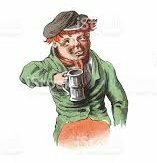 They often drank large quantities a weak type of beer known as "small-beer" which was more wholesome than the fresh water then available. Not only is beer more nourishing than water (for as we know, alcohol contains a lot of calories) but the alcohol content made the beer healthier than water from a sewage-laced stream or rubbish filled well. But ... would you really want to explain all that background just to move your plot on? The temptation is to change the storyline so that you're the one drinking the beer - or cut beer out of the plot altogether! So, if you read Dunmore's novel, notice how cleverly she's worked in the period detail. My current reading is quite different. 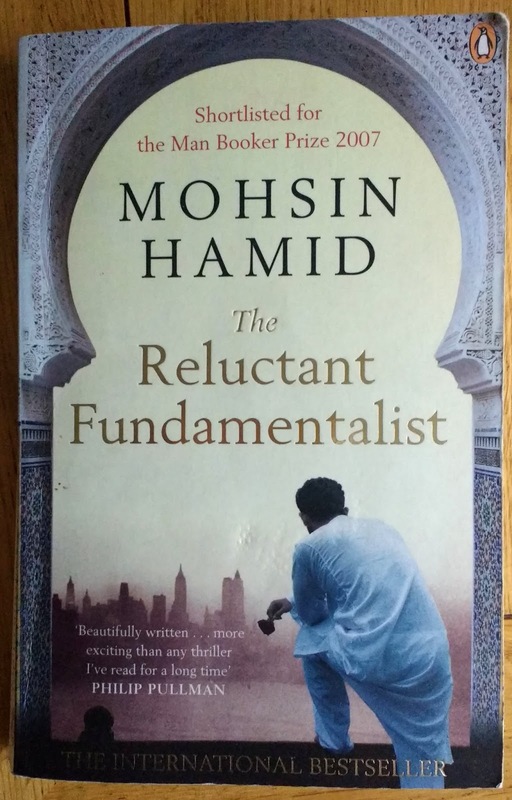 It's Mohsin Hamid's "The Reluctant Fundamentalist." The text consists of a conversation the Arab narrator has with an unknown Westerner in an Arab town. In fact, it's one half of a conversation, because the only person we hear is the narrator himself, talking about his life, what has happened in his past and what is going on around him now. Well, let me just say that I ended up thinking pretty hard about the book after I had finished it. I'd better not say more, in case you decide to read it. We had tickets booked for a concert at London's Roundhouse, and of course we went along to that. This well known venue was a steam locomotive turntable shed in ye olden days before first falling derelict and then being restored. We saw a somewhat peculiar performance of Monteverdi's "The Return of Ulysses." It was interesting, though, and the Roundhouse is a fabulous venue. 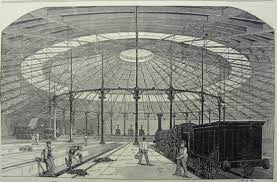 Here is a picture of its interior in railway days, complete with tracks and engines. This is how the ceiling looks now, complete with theatre fittings and lights. Can you see that the wrought iron pillars dividing the tracks in the old picture, are still visible in the modern picture? This is a view from the bar showing some of the exterior with a view down the road - lots of atmosphere. I wonder what those engine drivers would think to see it now. I hope I've saved up enough energy for a house guest arriving tomorrow, and Middle A coming to stay overnight for a birthday outing at the weekend, plus another house guest next week. I think it'll be fine. And I am gradually making my way around blogs, and I'll try to reach yours soon. Have a good weekend! Glad you're starting to get out and about. Getting sick it seems like forever to get all your strength back. Like the looks of the Roundhouse. Its an interesting place. I used to like it a little better in its far off hippy days but times have to change! Sounds like a serious bug - and there's a lot of it about; you take care! I know what you mean about too much politics on Twitter - same on Facebook. People don't seem to be able to debate without shouting anymore, or being incredibly insulting; what happened to reasoned argument? Enjoyed your usual wonderful meander! No worries, no rushing, it is much more important that you become healthy again than that you catch up online. Your doctor and your family will agree with that! Enjoy your guests and be gentle with yourself. We did have fun with our guests, it was wonderful. When Leo visited his family in Belgium in the late forties and fifties, they all, kids included, drank a sweet dark beer with meals. It used to be deliered in bottles, like milk. I do hope that you pick up soon...my mother tells me that there is a bug going the rounds which seems to sap all your energy. I think it is world wide though whether it has reached your bit of Costa Rica yet I don't know. I hope not. Blogger has been doing the same thing to me when it comes to posting a comment- it takes forever! So it's not just you. And trust me- it's not just you who is taking a long time to shake whatever bugs are going around. Rest. Don't push it. You'll be better in the long run. The bug I have that's making me tired all the times, is called "humidity". We've been experience steamy days and nights...and I'll be very glad when they're gone, done and dusted! Everyone is experiencing a delay in the publishing of their responses on blogs, I think. So, you're not alone there, Jenny. I'm one of the "everyone"! Once upon a time I used to burn incense frequently, but haven't done so in years. I still have my burners...but no sticks! For being lazy you sure are busy. The first photo is outstanding ! Thanks Parsnip! I was, in fact, very lazy - but am finally responding to comments! I do hope you feel better soon, Jenny - so many people seem to be felled by bugs this winter. 8 mins Tai Chi sounds wonderful - easy to fit into the day without making a performance of it. As for writing historical fiction - sometimes it’s really hard to exclude interesting-but-useless stuff. I found I needed to know so much that it was a question of which bit of info I needed rather than trying to find stuff out as I went along. Yes, the 8 min tai chi is something even I can do. And I am usually really bad at that kind of thing. I hope you continue to gain back your energy. This has been a harsh flu season here. I had a mild case of the flu, got over it, then got bronchitis. When I went to the doctor, he said I had what they are calling "the 100 day cough"--he went on to say it doesn't take you out of the game, it just makes you not want to play. And that's how I was feeling, pushing through each day. Luckily for me, antibiotics and steroids knocked it out in a few days. Yes, exactly it. It seems to have spread worldwide. I guess people take it around on their travels, I often wonder whether cabin crew on planes get sicker than most people. Welcome back, Jenny - glad to see you are beginning to feel better, and I'm sure all will be good with your house guests. The problem with commenting on blogger was felt all across the blogosphere but seems to have been solved. The "Reluctant Fundamentalist" sounds intriguing. I hope you get your strength back soon and will enjoy the weekend guests. My blogger has been the same, slow, so slow. Yes, I understand why alcoholic drinks were better than the awful water they had in ancient times. Dear Jenny, I'm glad you are getting better and can go out and even to go to the show. I was interested in London's Roundhouse, where it is located because I've been to Camden and my son studied there. It's a really modern equipped building. Love your first photo - the shadows are so long as they can be in winter day only. Did your son get to the Roundhouse ever I wonder? He will certainly have noticed it, it is very conspicuous. Most of its work seems to be with young people who are interested in music and creative arts. I so do hope your tiredness gets tired of itself and goes away soon Jenny. One of my sons may have had the same bug as he was dogged with extreme sleepiness for months, it only now slowly clearing. Your mention of difficulty placing comments, I have that too, in that comments take a while to appear rather than being almost immediate. I now watch the ‘waiting for’ box at the bottom L side of the screen, resisting the temptation to press again. As said, I hope your tiredness goes away soon. 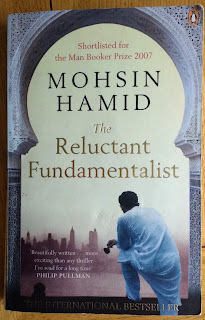 Perhaps you've read The Reluctant Fundamentalist now, and if you read it I hope you felt it was worth the time. I must post a few more book reviews. Lately I've been reading lots of interesting books, suddenly having a spell of fiction reading. I've never bothered with Twitter, I'm put off by all the vicious trolling that goes on which Twitter seems powerless to stop. Interesting point about historical novels having to put things into context or they make no sense from today's perspective. I went to quite a few rock concerts at the Roundhouse in the early seventies. Good to know it's still there and hasn't been demolished. Though it seems to have been considerably tarted up since the time I went there, when it was pretty rough and ready. I can relate to your tiredness, Jenny. Physically, I have not been sick for about nine months, but I am not me anymore. I am working on it, though, and like you, exercise is helping, along with meditation. I just have to push myself. That concert venue is beautiful. How wonderful that it was from an existing structure and refurbished for something so splendid. I am all for refurbishing notable buildings, it keeps character to the place. I prefer them to be transformed into public buildings rather than apartments, although apartments are better than nothing! Same, but I'm using my grounded time to really get going with instagram and resurrect my almost abandoned blog! Hope we will both soon feel better. I too enjoyed Birdcage Walk and must read more Helen Dunmore. I just can't get into Instagram, I suspect because I already find it hard enough to keep up with other social media. Yet in a way it is the one which is most beautiful and interesting. I ought to give up twitter but the political stuff has a malign hold on so many people now, including me. Oh Jenny, that bug sounds just grim. It's terrible enough when you are feeling bad at the start but to not feel that return of energy is so defeating. I'm glad you got out and hope that helped. The tree shadow photos is a stunner and that concert hall looks pretty gorgeous. And being down does give us time to read -- both your books sound very intriguing and interesting and now I'm thinking about the historical fiction dilemma. Hadn't really thought of that before! Hope you are back in business for your guests! Hoping this finds you feeling better. Hugs! Indeed it takes weeks for it to go and it comes back in successive but weakening waves. I have suffered the brute for years and last year it was almost 365 of it. It does go and it does make you er, listless I will say, and people do not believe you. It's a horror but will go. Great picture of trees and shadows. 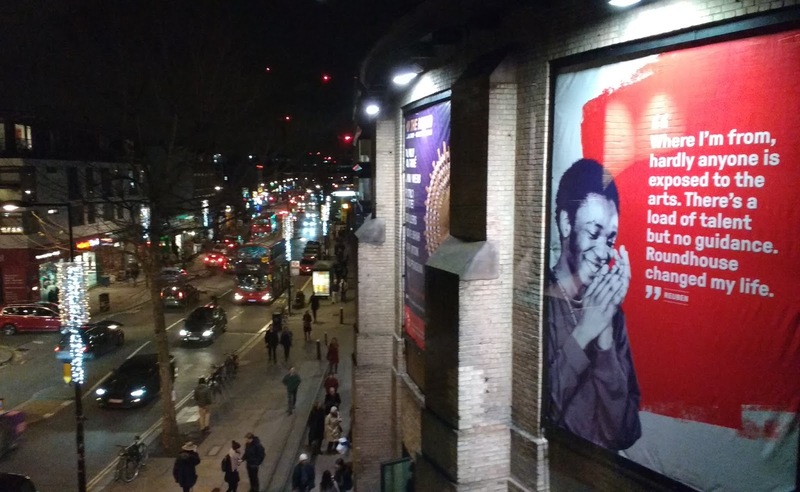 I saw Twelfth Night at the roundhouse in 1973 when the group I was with got free tickets. We had hoped for a rock band and somewhat grudgingly went along. The Prospect Theatre Company were magnificent! The Fool especially. I note it has changed greatly since that time. It was a bit rough and ready then. You spend too much time on Twitter? Really...? I also was sick in early January and am still feeling the effects weeks later! Hope you will be feeling better soon. London's Roundhouse, that looks very interesting to me. Lucky you, to have so much to see in London! Yes, there is always something to see, makes me glad I live here! Another great building is the Tate Modern which used to be a 1930s power station. It's perfect for art, the old turbine hall is just right for huge installations. Yes, I definitely have a love hate relationship with historical fiction but the sad truth is that people in the past were often very keen on stuff that is way out of fashion now, or even quite disapproved of now. It's always interesting to see how the line can be kept. There is not really any excuse for people explaining their own background to their own relatives in a play though, is there? ! So sorry you were sick, and I am glad to hear you are getting better. Please do not hurry and take care well yourself. Thanks Tomoko, I hope you are not too cold in snowy Nara right now! Thank you! Very relieved to be feeling better now, I just have to make up the fitness I have lost while I was so listless, and I am working on that. That sounds like an interesting book. I'm sorry you've not been feeling well. I took Tai Chi for a little while before I moved and loved it. I'd like to return to it some day. THe nice thing about the 8 mins is that it really isn't possible to make an excuse that you don't have time to do it, so it gets done. And even that litttle time makes one more mindful. It takes a while to recover from being sick. Feeling tired is your body's way of telling you that you should rest some more, so don't feel guilty about it. I was impressed that you did 4 miles on the treadmill the other day. I have been walking around the neighbourhood and and doing 4 or 5 miles occasionally (not enough yet). I get bored on the treadmill and don't think I have the discipline to do that. oh i hope you are feeling better now my friend! glad you got out and took some lovely photos ,this one looks charming and artistic shot! take great care my friend and get well soon! Thank you baili! It is interesting to read the book, it does not seem to take sides to me but I am sure I do not fully understand the ins and outs of it. It would be very interesting to hear your thoughts. We have a Pakistani friend here in London who often goes back to Karachi and there is definitely some danger and awareness of terrorism danger there. So I am sorry if I seem insensitive, it is bound to seem different from my perspective. Our guest visit was really fun thank you, and we were sorry when he went back to Japan! Have a good week! I ordered Birdcage Walk from my library after you wrote about it. I just got a notice saying it is in the hold section for me to pick up and I expect to do that tomorrow. Sure hope you feel more energetic soon. People here are getting laid quite low by the flu and it seems to linger on for ages. I'm avoiding crowds and hopefully avoiding whatever bug is on a rampage. Hope you enjoy it. I have not seen blog posts from you recently and I hope all is well for you. It's so cold now. I hope you take good care. It sounds as if it is colder in Japan, I feel that spring is on the way here in London but that could change as we sometimes get a cold snap. finally catching up with you, I just returned from four and a half months in London, I am not pleased to be back. Thanks you for the great look at the roundhouse! Fabulous! Did you get to see it when you were here? It is a little way out of the very centre so you probably would not have done unless you were visiting Camden anyway. Glad to hear you’re on the mend. Birdcage Walk sound interesting. I see Helen Dunmore has just won the Costa Book Award for her poetry collection. What a shame she didn't live to see it. Thanks Sue. I liked the shadows too. I love shadows and reflections in photos. I'm glad you feel well enough to get out and about again because I love seeing your photos from all your adventures. The flu bug really has knocked people out this winter. 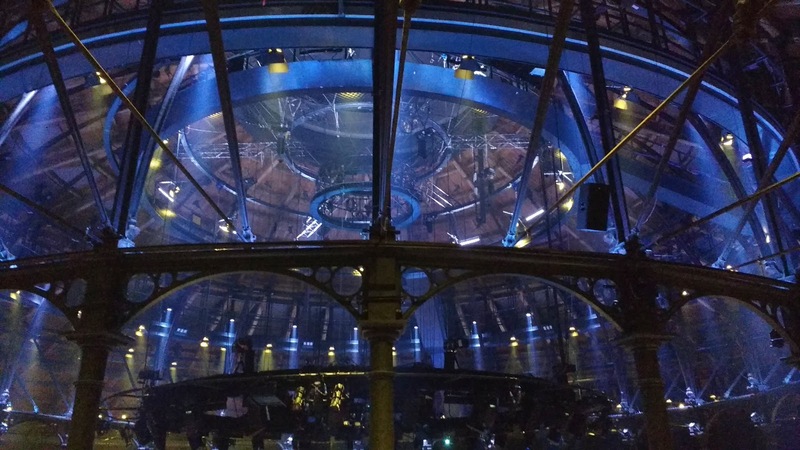 I've never been to the Roundhouse but it looks fascinating and I like the view from the bar. Used to be a big thing for rock concerts, and still runs big musical spectaculars sometimes. It is worth going just for the experience of the architecture, it is very striking. So sorry I’m so late here, Jenny! I hope you’re feeling better now anyway. Both the books you mention sound compelling. I shall have to look them up! I do agree about the historical details in fiction being hard to include. I’ve had that myself. The roundhouse looks amazing. I never knew it used to be a railway shed. I suppose it was round so it could accommodate those turnimg circles for engines.